WineM is a Technology Sketch of a smart wine rack. It’s designed to locate wines in a wine rack using RFIDs attached to bottles and to display which wines have been located using LED backlights behind the bottles. Collectors (or anyone with a large wine cellar) can use it to search through collections, track the location of specific bottles and manage inventory with a minimum of data entry. Linking bottles to networked databases can provide information that would otherwise be too time consuming or difficult to obtain (for example, the total value of a collection, or all the wine that is ready to drink). Wine comes in a bewildering amount of varieties, which are helpfully packaged in a standard set of bottle sizes. Thus, although storage is standardized, information about what’s in the bottles becomes critical. However, getting access to that information is difficult. Some information about each wine is available on the label, but there is additional “metadata” about each varietal, vineyard, vintage and history that sommeliers and collectors often track solely through memorization or wine journals. As in many other situations, new technology cannot replace people, but it may be able to harness some of the collected knowledge to provide a better experience for those who don’t have the information at hand. Our goal in envisioning WineM was to make it easier for someone who owns more wine than they can keep track of to get more pleasure out of their collection – without hiring a sommelier or becoming one. 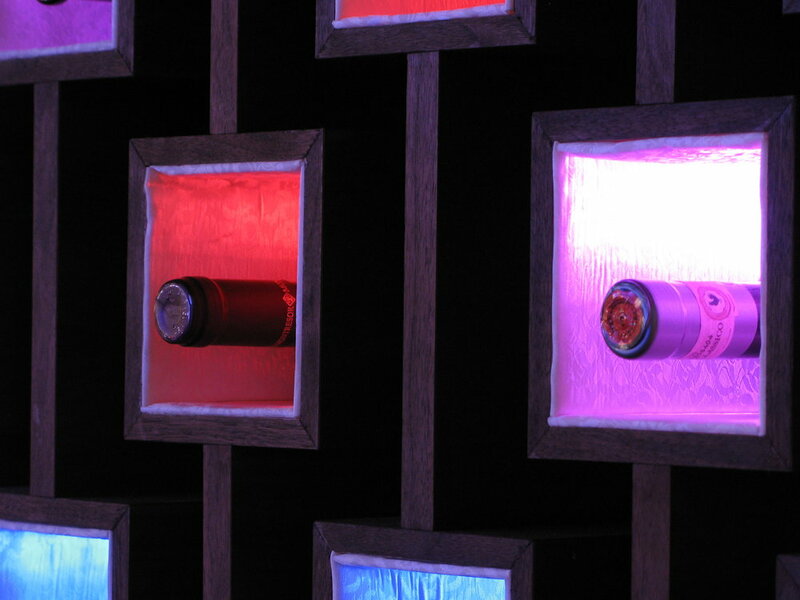 Wine racks, like other furniture, are typically stationary, large enough to include electronic hardware without changing their form, near power, and have a purpose outside of the technology, providing a working fallback use even if all the technology fails. Wine collector profiles are similar to that of advanced technology buyers. Although wine drinkers (192K PDF) come from all walks of life, wine collectors (272K PDF) share many qualities (1.3MB PDF) with high technology buyers. IntelliScanner’s Wine Collector, and the eSommellier scanner and system already exist. Our goal with this sketch was to take the functionality of these systems and make them less focused on record-keeping, while using the capability of networked, open databases as much as possible. RFIDs provide a convenient identification and tracking solution, and RGB LEDs provide a good display system. Combining these two technologies can significantly increase the value of networked wine databases by putting the information about the bottles where the bottles actually are. The core technology is an RFID reader that is installed in each of the cells in the wine rack. 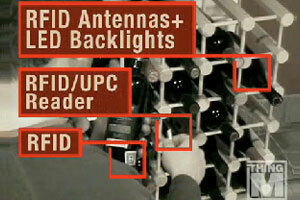 These readers identify what RFID, and thus what bottle, is in what cell, so that it can be located and managed. If a bottle is removed, the total valuation of the rack can be instantly decremented; if that bottle is put back, the value adjusts to its original value automatically. In this way, the focus stays on the wine, rather than the record-keeping. Each RFID is associated with a specific wine, and all the metadata that goes along with that wine (varietal, vintage, country, region, etc.) by scanning the UPC barcode on the side of the bottle and associating that barcode with the specific RFID. Not every bottle has a UPC barcode, but most do, as it’s defined by the winery. Many UPC databases exist (free ones include UPC Database and UPC Wiki), which can help resolve the specifics of which wine is in the bottle, and then wine databases can be accessed with that information to get at the rest of the information (maybe by linking to the ISWN, though that standard does not seem to be in broad use). This browsing allows us to treat the database of wine information as it is physically represented in the wine itself, keeping attention focused on the objects, rather than their data representations. As you’re looking for a wine for dinner, WineM could publish a feed of your wine collection to a social networking service that identifies other people who have similar tastes. As part of our product development process, ThingM creates Technology Sketches, which are examples of early stage conceptual approaches to how a product might work, rather than actual fully-functional systems. We believe in lightweight, agile, user-centered product development, which means that we focus on users’ experiences first and technological details later. We prefer to explore ideas first without the constraints of technological limitations, before we create technologies to address those limitations. Our Technology Sketches document that process, the kinds of ideas we have, and how we develop them. 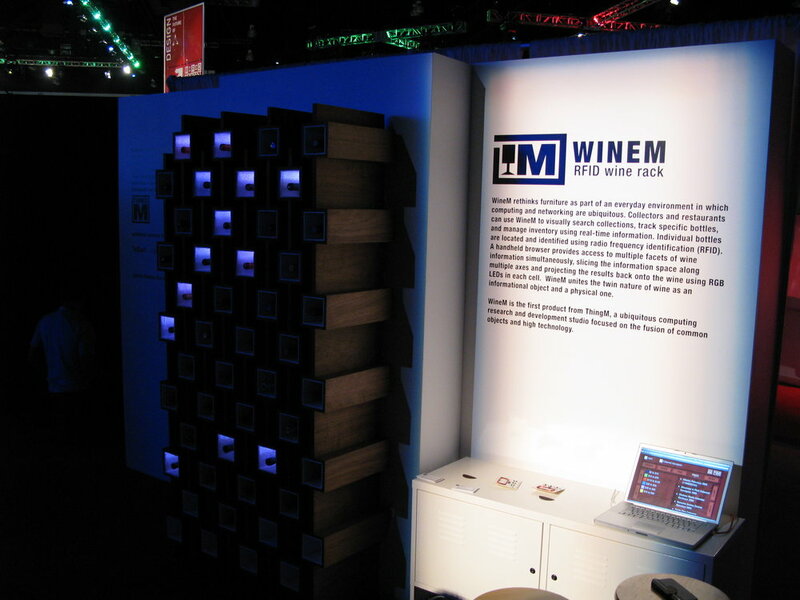 We are continuing to develop the ideas and technologies at the core of WineM. The final product that uses those ideas may not resemble what is in the sketch, but the sketch will have been an important part of the development process, and one we share because we feel that others may benefit from it. If you are interested in this technology sketch and would like to work with us to develop this technology further, please contact us.